Apple is delicious and crunchy fruit that contains lots of health and beauty benefits. Apple fruit is usually found with oval or pear shape and the outer skin has different colors depending upon the cultivar type. The juicy pulp of apple has off-white to cream in color and has mix of mild sweet and tart taste.The seeds inside the apple pulp are inedible because of their bitter taste. It is often recommended to eat apple along with skin. Most of the dietary fiber, vitamin C and vitamin A are found in the skin. The skin of Apple contain pectin that can help remove toxic substances from the system by supplying galacturonic acid. Recent research shows that the pectin in apples reduces the risk of colon cancer and helps maintain a healthy digestive tract. The phenolic compound found in apple skins also prevents the cholesterol that gets into your system from solidifying on your artery wall and prevents from the plaque. When plaque builds inside your arteries, it reduces blood flow to your heart, leading to coronary artery disease and many other fatal problems. The American Institute of Cancer Research (AICR) recently added apples to their list of Foods That Fight Cancer.In laboratory studies, flavonoids such as quercetin and the triterpenoids found in apples have slowed the development of cancers of the colon, lung and breast in several stages of cancer development. Apples not only slow down the development of cancerous cells but also prevent from cancer. Recent scientific research in Finland discovered that those who frequently ate apples were less likely to suffer a stroke. Another recent study, from Wageningen University in the Netherlands, indicates that fruits with white flesh, such as apples and pears, can reduce stroke risk by 52%. Recent scientific studies and experiments proved that people who have a diet rich in fruits that contain antioxidants like apples are 10 - 15 % less likely to develop cataracts. Gallstones form when there’s too much cholesterol in your bile for it to remain as a liquid, so it solidifies. They are particularly prevalent in the obese. To prevent gallstones, doctors recommend a diet high in fibre like apples to help you control your weight and cholesterol levels. We are constantly consuming toxins, whether it is from drinks or food, and your liver is responsible for clearing these toxins out of your body. Luckily, one of the best and easiest things you can eat to help detoxify your liver is fruits like apples. Multiple studies have shown that eating apples, and even applesauce, on a regular basis will decrease your risk of developing abdominal fat.A Brazilian study found that women who ate three apples or pears per day lost more weight while dieting than women who did not eat fruit while dieting. The pectin in apples lowers LDL (bad) cholesterol. People who eat two apples per day may lower their cholesterol by as much as 16 percent. According to recent research, high soluble fibre intake slower buildup of cholesterol-rich plaque in your arteries. The phenolic compound found in apple skins also prevents the cholesterol that gets into your system from solidifying on your artery walls. When plaque builds inside your arteries, it reduces blood flow to your heart, leading to coronary artery disease. Recent Scientific research found that a flavanoid called phloridzin that is found only in apples may protect post-menopausal women from osteoporosis and may also increase bone density. Boron, another ingredient in apples, also strengthens bones. Research has shown that people who eat fruits and other high-fiber foods gain a certain amount of protection against Parkinson’s, a disease characterized by a breakdown of the brain’s dopamine-producing nerve cells. Scientists have linked this to the free radical-fighting power of the antioxidants found in apple. Apples contain a good amount of pectin, a natural occurring fiber which helps bulk up the stool to treat constipation. Laxative properties of apples soften the stools to treat constipation. Apple fruit, as well as apple juice is also very helpful to cure constipation. Try to drink fresh apple juice every day which contains fibers like soluble and insoluble that loosens the stool and promotes regular bowel movement and prevents from constipation. Recent scientific research proved that women who eat at least one apple a day are 28% less likely to develop type 2 diabetes than those who don’t eat apples. Apples are loaded with soluble fibre, the key to blunting blood sugar swings. Apple not only lower the risk of diabetes but also manage diabetes.The pectin in apples supplies galacturonic acid to the body which lowers the body's need for insulin and help in the management of diabetes. Recent scientific study found that rats fed an extract from apple skins had a 43 percent lower risk of colon cancer. Other research shows that the pectin in apples reduces the risk of colon cancer and helps maintain a healthy digestive tract. Apple contain a rich amount of anti oxidants that prevent the skin from free radical damage and slow down aging process. 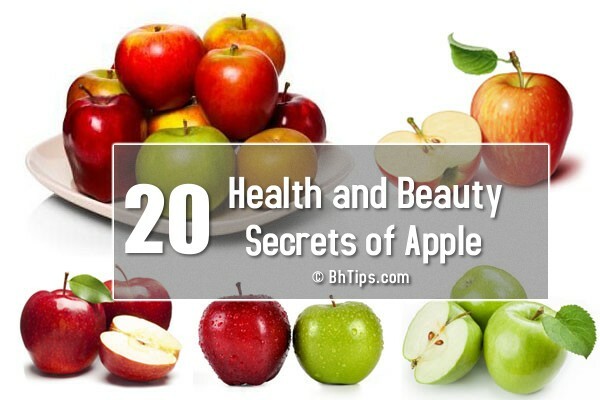 Apple contain a good amount of Vitamin C which help a lot to get blemish free glowing skin. Application of apple slices or juice also help to smooth wrinkles and fine lines. It’s been scientifically proven that the malic acid in apples can actually whiten teeth. Malic acid is commonly used in commercial tooth whitening products, because it safely dissolves stains from the surface of teeth. Although apple won’t replace your toothbrush, but biting and chewing an apple stimulates the production of saliva in your mouth, reducing tooth decay by lowering the levels of bacteria. So, if you want to whiten and brighten your teeth, it’s as cheap and easy as chewing on an apple after meals.